DUBOIS COUNTY -- With a record-breaking 201 volunteers and 37 helping with the event, 2220 pounds of trash, 8 tires, and over 600 pounds of recyclable plastic, aluminum and other metals were removed from around Patoka Lake during the annual Cleanup Day on August 25, for a grand total of over 3000 pounds! 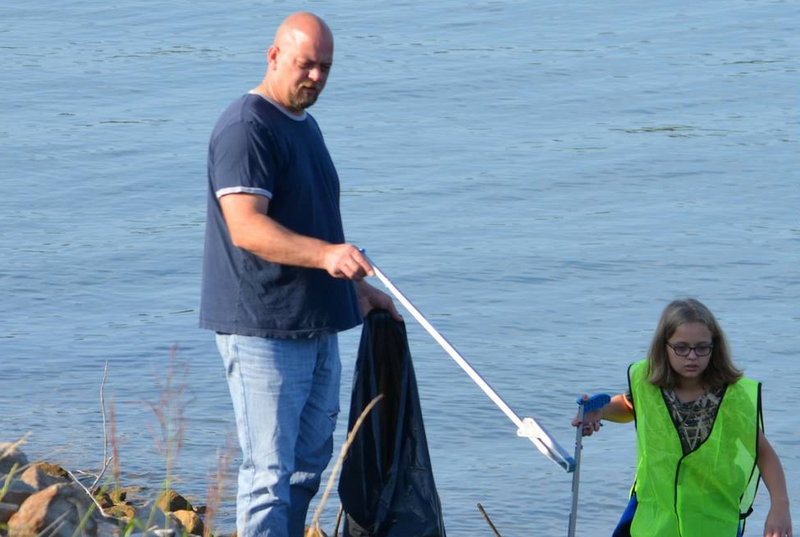 Volunteers picked up litter to help ensure clean drinking water for more than 100,000 Southern Indiana residents and beautify the shoreline. In this 12th annual event, residents made this a family event, and numerous high school students, scout groups, businesses and organizations utilized it as a service project. Volunteers swarmed into the Corps of Engineers facility at the Patoka Lake Dam to sign in at 8:00 a.m. They then met with a conservation officer for safety instructions, were assigned an area of shoreline, received safety supplies, trash bags, recycling bags, and water. The volunteers were sent around the entire lake on shorelines, ramps, and roadways. At 11 am, everyone headed back to the dam to be treated to a free fish fry, music, event t-shirts, goody bags and prizes. Amazingly, the rain only left a few drops on event organizers at the very end of take-down, after all volunteers were long gone. Patoka Lake Cleanup Day is organized by the by Patoka Lake Watershed Steering Committee with much assistance from Patoka Lake Regional Water & Sewer District, IDNR/Patoka Lake and U.S. Army Corps of Engineers. The watershed committee depends on the generosity of local and regional financial sponsors to make their projects a success.